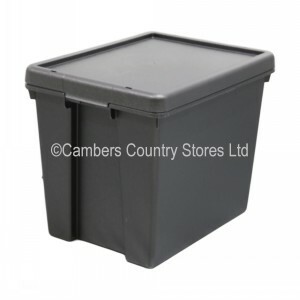 Recycled Wham Bambox Heavy Duty Plastic Storage Boxes With Lids. Outside dimensions (L x W x H): 385mm x 290mm x 315mm. Inside dimensions: (L x W x H): 355mm x 260mm x 300mm. Very heavy duty British Manufactured storage box with lid. Black - made from recycled material. Durable and strong, made with best quality, high impact resistant plastic. Positive click shut lids with hole for cable tie fastening if required. These boxes are not the normal type you will find in the DIY chains - they are a totally different type being much thicker sided, made from better materials and will last much, much longer!